Today's notable sporting integer is 15. Fifteen is the first number, counting from one, which is not immediately associated with handfuls of notable sporting heroes. Why should this be? I have absolutely no idea, as it seems to me to be a perfectly serviceable number . Anyone wearing it would no doubt look very handsome and make their grandmother enormously proud. It is the number that is always worn by the full back in rugby union however, so there is no shortage of competition for our purposes: even if they haven't strictly chosen it for themselves. I like to think that if they could have, they would. As such, I have picked one of the most notable rugby full backs ever to play the game, a legend of the sport in the British Isles: former Scotland captain and six-time British and Irish Lion, Gavin Hastings. 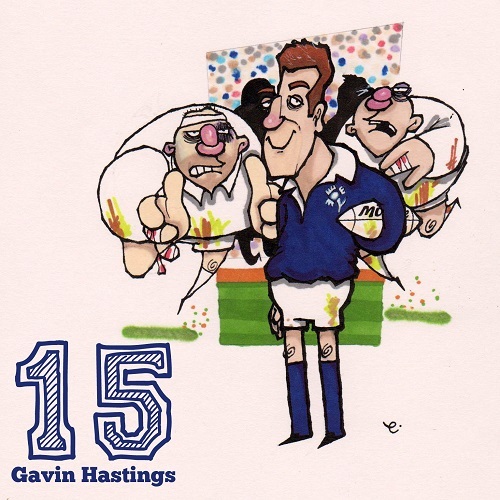 Hastings also played 61 tests for Scotland and, with a combined 733 points, he is the all-time British rugby union top scorer.